The latest data from research firm Strategy Analytics shows that Apple currently accounts for two of the three top-selling smartphone models shipped worldwide. iPhone 6s was the world's top-selling smartphone in the second quarter of 2016, based on an estimated 14.2 million shipments, while the two-year-old iPhone 6 trailed in second with an estimated 8.5 million shipments. Strategy Analytics added that the iPhone 6s is "currently the world's most popular smartphone," implying that it has remained the top-selling smartphone through the third quarter leading up to the launch of the iPhone 7 and iPhone 7 Plus. 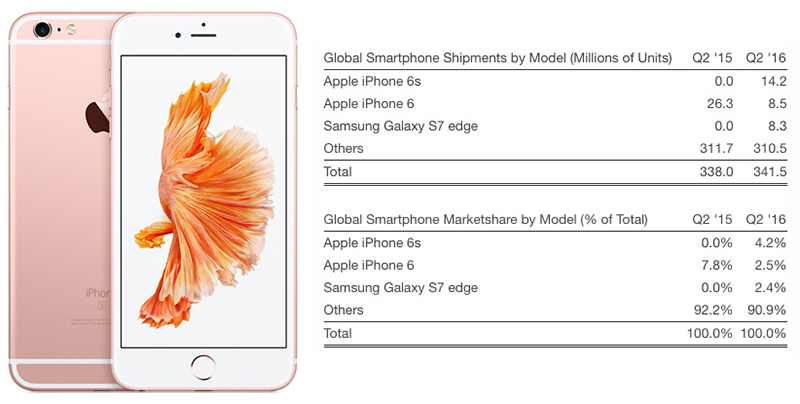 Both the iPhone 6s and two-year-old iPhone 6 outsold Samsung's newer Galaxy S7 edge, released in March 2016, which finished third with an estimated 8.3 million shipments in the second quarter. Apple officially reported sales of 40.4 million iPhones during the second quarter, including the iPhone 6s Plus and older models. iPhone 7 models could remain the top-selling smartphones worldwide through the holiday shopping season after Samsung's voluntary Galaxy Note7 recall due to isolated incidents of exploding batteries. Some analysts forecast the "heartbreaking" recall could cost Samsung between $1 billion and $5 billion in revenue. This phone is a complete beast, I won't replace my 6s for at least 3 years. After coming from android (Galaxy s6) 6 months ago to the i6s I feel like the iPhone is in its own league and android is just a cheap Chinese copy, that's how it feels to me. Most impressive iPhone since the 4, in my opinion. Stonkingly good hardware. Touch ID is instantaneous. I personally don't mind the design, protruding camera and all. I'm still really happy that Apple put nearly everything I care about from the 6S into the SE, which for me has a superior form factor (both in size and shape, IMHO). I agree with those who say the 4/4S was their favourite ever though. The iPhone 6 and the (high-horsepower) 6S represent Apple's long, long awaited foray into larger-screen-phone land. It's no surprise they are the most popular phones around. Not to mention their brand cachet. They are excellent devices in their own right. And for those who like to keep it simple, they are outstanding devices (as all Apple products are in their "limited" niche). Apple devices may not do everything others can, but what they do set out to do, they (arguably) do it better than anyone. Whether this info is totally accurate or not, I love my 6S Plus and I'm sure everyone will be clamoring for the next one too. And the 7 will make it even more popular, especially with those who don't want to part with the headphone jack just yet. Lol at that obsolete thing. Can't wait to see the 7 tomorrow. I have to admit that the 6s impressed me. This is true. It's also why I love the SE move so much. They managed to significantly reduce the price of entry for a (mostly) current-spec iPhone, not shipping something with an old processor (ahem, 5C) but also not ignoring the fact that many people will sacrifice a few features to get a cheaper phone. After the iPhone 8 is released, I hope they have another SE based on the 6/7 body for $399 or less. Until then the 5-based SE and discounted 6S will do nicely for those on a tight budget. No, they will never compete with the $100 unlocked android phones, but that's probably a good thing because those phones are generally crap (and have next to no customer service/support). Yep, the SE is my favorite iPhone as well, mostly for my preference for the smaller form factor but also because it's the best relative value in the lineup.